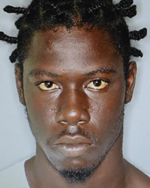 Basseterre, St. Kitts, April 10, 2019, (RSCNPF): Twenty-five-year-old Kevon Hamilton of St. Paul’s was sentenced to life imprisonment on April 05, 2019. He was convicted on November 29, 2018, for the murder of Ernest Hendricks that occurred on July 07, 2015. The court commented that murder with a firearm places that type of murder into the worst of the worst. The court further argued that his seemly good character or attempt at rehabilitation whilst in prison cannot overshadow what he did.